Yarn: Cascade Fixation in really, really, really bright red, 1.8 skeins, approximately 180 yds total in the socks. Comments/mods: As this is my own pattern, I certainly can't own up to it being anything less then stellar. However, I did modify a few things (and found a few boo boos in the pattern that I'll fix once RAB is over and done with). First off, I knit the medium size for stitch counts, but used the length measurement for the large size. 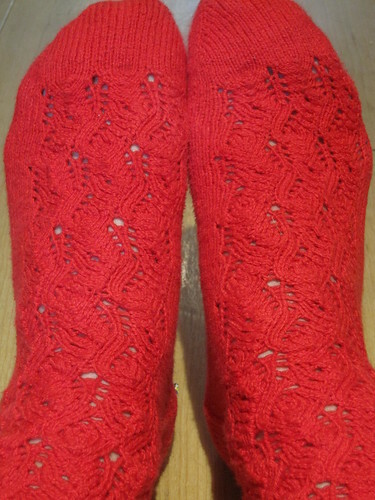 I did this because I was worried that the lace pattern stretchiness might make the size large too loose around the foot. I knit the pattern as written for the first sock, tried it on, and realized I needed some adjustments for the leg - it was impossible to get on! So I increased 4 stitches after finishing the heel flap (instead of decreasing) and switched to slightly larger needles. That did the trick. Finally instead of making these short, ankle-length socks, I kept going until I was almost out of yarn. 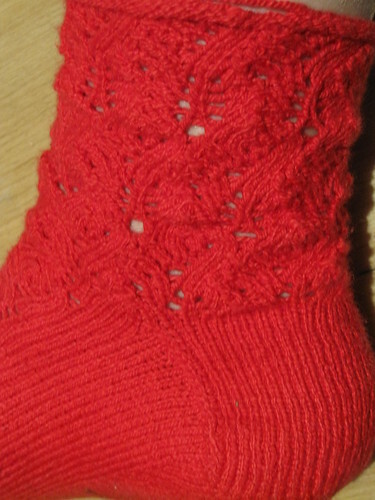 I really like how socks made from Fixation fit and feel, but I hate hate hate knitting with it. It hurts my hands like nothing else. Sadly, there are now several partial balls of Fixation in my stash (as well as a couple of whole ones!) that I may just have to get rid of. So, I am absolutely thrilled that after five months of 2011, I have five finished pairs of socks to show for it. I'm a bit worried that June is going to throw a spanner into the works however, what with this silly 953 mile bike ride I seem to be doing. But I think I've come up with a possible solution: Aran weight socks. To be fair, using aran weight yarn seems like a huge cop-out, on many different levels. But here's my rationale: for at least 10 days next month (and probably more like 12 or 13), I will be too tired from riding my (lovely new, see in first picture) bike up and down the myriad hills that make up this damned island, or too busy lying on a beach in Cornwall trying to recuperate (please don't let it rain!) to knit a single stitch. 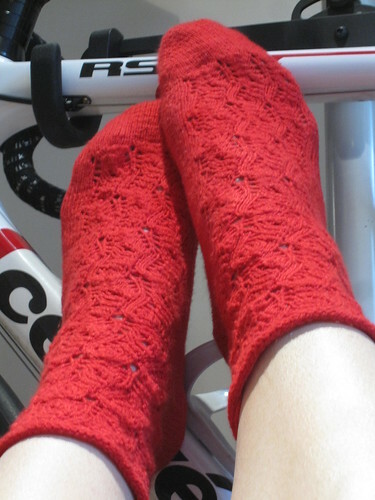 And I'm also going to design these socks myself instead of digging in to the pile of SISC bags waiting upstairs (deadline is early July). So that seems fair, doesn't it? Written by porpoise On May 28, 2011 In "11in2011", "FO", "Project Spectrum", "cycling", "designs", "socks"